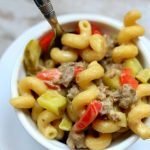 Instant Pot Cheeseburger Macaroni and Cheese–Cheeseburgers and macaroni and cheese all in one delicious and easy to make dish! 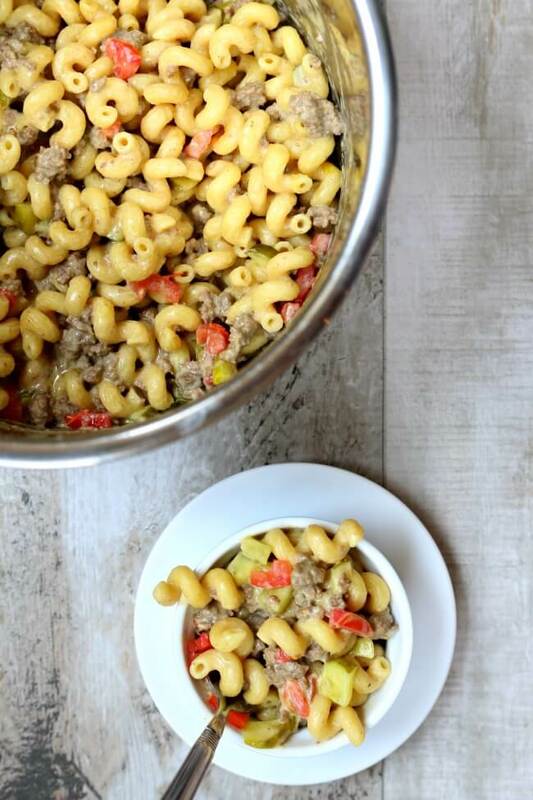 Cheeseburgers and macaroni and cheese all in one delicious and easy to make dish! Turn pressure cooker onto sauté function. Once the pot is heated up, add in the ground beef. Brown the beef and then transfer it to a colander and drain off extra grease. Set aside. Turn the pressure cooker to the sauté function. Stir in the evaporated milk and slowly add in the cheese while stirring constantly. In time, the sauce will thicken up and the macaroni will become coated with a creamy, cheesy sauce. Gently stir in the beef, pickles and tomatoes. Turn off the pressure cooker. Scoop macaroni into bowls and serve. Evaporated milk has sugar so I will need to substitute. Do you think an alternative milk such as cashew milk will work ? Sure. Or cream or half and half. Do I drain thebnoodles before adding milk and cheese? Good call on the thousand island! !